This is new and different – an original concept by Sam Dalal, and produced in a deluxe manner. 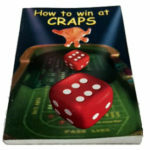 The performer shows a flick book – an animated “multi-media” publication that professes to teach How to throw dice to win. A spectator is asked to throw a pair of imaginary dice, and mentally have them roll to any winning combination – any of the six double spots. There is no force – the spectator freely selects any of the six possible winning combinations. The performer flicks through the book, and it shows a pair of dice being thrown, and finally coming to rest with the exact combination selected by the spectator. You can flick through the book repeatedly to show the animation, and it correctly depicts the spectator’s choice !!! Is it just Luck or Intuition, or is it the spectator’s inexplicable Mental Powers ? Produced on heavy grade art paper in full color, the 42 page flick book we supply is cleverly gimmicked to produce the animation with the final result you desire. It comes complete with detailed presentation and handling instructions. And the complete effect, ready to work comes to you at a very affordable low price. We can safely predict you’ll find this excellent value.